The shape of the diameter distribution is one of the important elements characterising forest stand structure. In this work we present the application of the method of moments for the estimation of the parameters of a 2-parameter Weibull function. Due to its properties, this function is often used for the description of the diameter distribution in forestry. 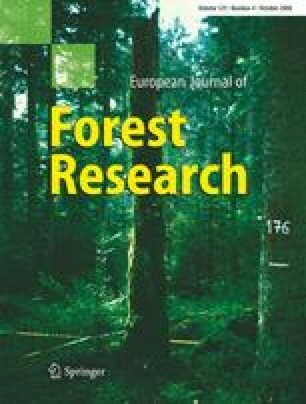 The work analyses the properties of the Weibull function and its application to a data set representing natural (virgin forest Babia hora) and managed forests (Litschau and Forest School Enterprise of Technical University Zvolen). The parameters of the Weibull function are simply and reliably estimated from the basic stand variables, namely the mean diameter and the coefficient of variation of the diameters. The method is general and does not require specific parameterisation, e.g. for the individual tree species. The work also presents a new algorithm for the estimation of parameters in cases, where tree diameters are measured from a certain minimum recording limit. Based on this study, we suggest using the Weibull function in forest stands only for uni-modal diameter distribution with a mean diameter above 7 cm. This work was carried out during the research stay of J. Merganič at the BOKU University of Natural Resources and Applied Life Sciences in Vienna, financed by ÖAD during 2002–2003. We are very grateful to Prof. Šmelko for providing us with the data from permanent inventory plots of FSE TU Zvolen for the presented analyses. We also thank Robert Williams and two anonymous reviewers for their comments, which helped us to improve the quality of the presented paper.